Hello and sorry but my question might be a bit irrelevant. 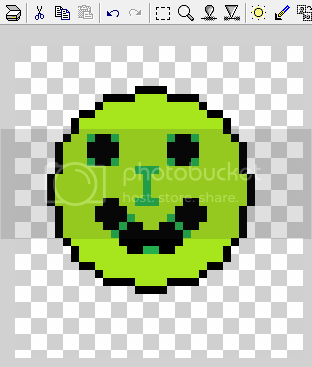 It's the first time I would like to participate in such a competition and I was wondering if anyone can suggest a free tool that I might be able to use in order to make the trinket. Thank ye very much. I think the Cloverfly is quite cute, personally. Tough call about the wings. I think I prefer the fully separated wings, but you can always leave both up, unless you're working on another design. Or, even compromise between the two, and bring the line within one or two pixels of the body. Yeah, I think 2 pixels would be the best. Thank you for your reply. I've got a problem. When I upload my trinket on the hosting site (photobucket), the colors change. What could I do about it? The arrrtists can touch things up if they have to, but providing an image ready to go into the game will increase your odds of getting selected. Is my Cloverfly 'ready to go into the game' (except the fact that the background isn't transparent)? 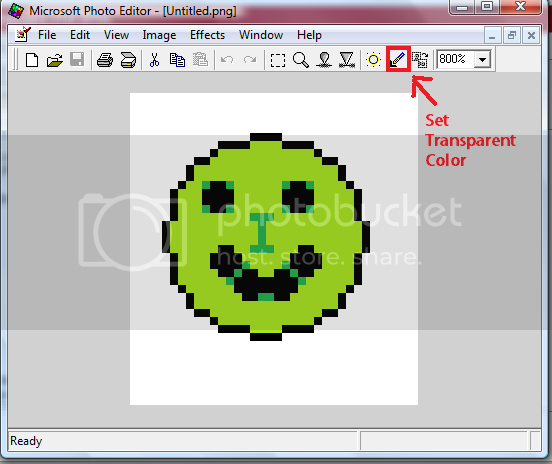 To get a transparent background, I used Photo editor (which you can download for free using the instructions below, or it is part of older versions of Windows). 2. Select the "Set transparent color tool" (At the top, next to the little icon that looks like a sun). 3. Click your background colour (Use the mouse wheel to zoom in if you need to). 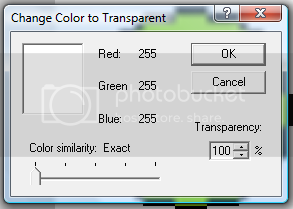 In the box that comes up, make sure it is set to "Color similarity: Exact" and "Transparency 100%", then click "Ok". And that's the deadline - thanks, everyone! When do we know if our trinket will be used? When Puzzle Pirates releases them or earlier? Great entries btw guys!! Because I like to look at entries all together and thought others might like to also...Here they all are. I did not check to see if they met the guidelines, and I suspect there are some that do not, but I will leave that up to the judges. Results will be posted in this thread. Congratulations, all! I'll deliver the pirate flags now, and the trinkets as they become available in the game. Note that the arrrtists may make tweaks to your designs before they go in - particularly in terms of color choice (e.g. one color choice instead of two, or recoloring a part that you didn't mark to be recolored). They will also make the final decision on trinket names. I don't know yet whether these will be available for a whole "season" or only for particular dates. We'll wait and see! The judges also commented that there were several really good designs that got cut out at the last stage of judging, so you're encouraged to re-enter designs next year if you want to! Congratulation to all the other Winners. Many thanks to the judges for a speedy result - I'm extrememly honored to be selected :D There were SO many terrific trinkets and I'm going to be SO broke when they're released! Thanks and congratulations to the winners and to the other participants too. My first thought goes in fact to those who didn't win, because I can imagine how much effort they put into their designs: they all look great. Don't give up, guys! We are all looking forward to seeing the beautiful entries with which you can come up for the summer edition! All the entries are so great! Is there any chance of seeking out a little feedback? What can I do to improve? So happy to have my shamrock selected from all those lovely designs, now I'm off to design some eggs. As always I'm a bit sad not seeing some of my favorites, but I'm also glad to see my other favorites ;-) Anyway if all winning entries will be introduced in game (and I understand this is the case) there's going to be lot of new trinkets to enjoy sometime soon. Novice/Able at Poker and proud of it! Great! I'm so happy that almost all my favorites won. Congrats to the winners!